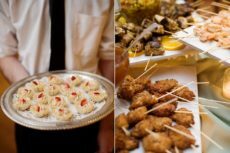 Our catering philosophy at Hallie Jane’s is “simple and delicious.” For that reason, food is priced per guest and includes all flatware, china, glassware, and napkins necessary for that menu. Prices include garnished serving trays and necessary chaffers. We will also use the customer’s pieces provided they are dropped off three days prior to the event. 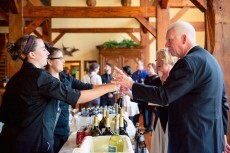 Hallie Jane’s provides uniformed and trained servers to set up, serve, and clean-up the event. Hallie Jane’s does not use temporary services to staff any of our events. The service charge ranges from 25-30% of the food and beverage cost, depending on the style of service. A buffet using disposable goods would be a lower percentage and would go up to cover more formal styles such as seated affairs or stations menu requiring additional servers to carve, sauté, etc. 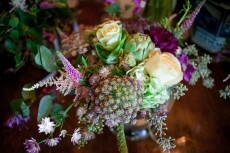 Hallie Jane’s Catering can provide any size, shape, color, and material of any rented item available on the market. In the event any rented goods are damaged, whether due to actions of the customer or their guests, the customer will be financially responsible for the replacement. Rental items not booked through Hallie Jane’s will be the customer’s responsibility. 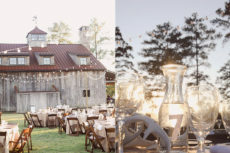 Hallie Jane’s can provide the setup and break down of the rental items if the rental company or venue does not provide this service. It is the client’s responsibility to return any rental items to the appropriate companies. Hallie Jane’s will not be held responsible for any equipment independently rented by the customer. Table linens are for rental only. In the event that any of the linens are damaged, whether due to actions of customer or guests, the customer will be responsible for replacement costs. Prices vary depending on the type of linen. We request that all adjustments to linen orders must be made 14 working days prior to an event. For a sample contract, Click here.